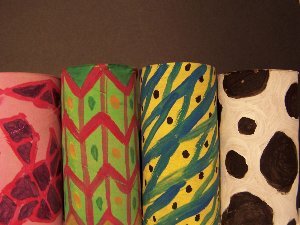 Here is a step by step guide on how to make a didgeridoo from cardboard tubes. It is a very unusual and ancient instrument that the Aborigine people play. Once we make it we can decorate it with some symbols they use for day to day life. You have 2 choices of what cardboard tubes to use. 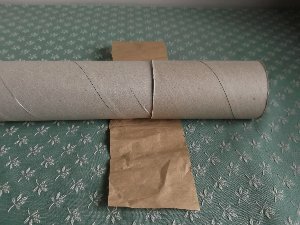 A tube from gift wrap paper is very long so it is ideal for this homemade musical instrument which is very long. The Aborigines make real didgeridoos from hollow trees. 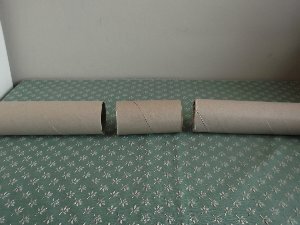 The other choice, if you can`t get a long tube, is to join together some shorter tubes from kitchen or toilet paper rolls. If you do have to join them don`t be disappointed because the joins can make a didgeridoo look like a real one. We will show you how! Collect together enough that will make it at least 70 cm (28") long. Some are wider than others so try and get them roughly the same size. You can push each end slightly into another by just squeezing it a little and easing it in. Not a lot or you will end up with a midgy didgy. The next step is to get some brown paper. No sticky tape won`t do! If you use sticky tape you will have problems when you start to paint. It will just dust off when dry as poster paints tend to do on smooth, shiny surfaces. Brown paper or white if you don`t have brown will be better. 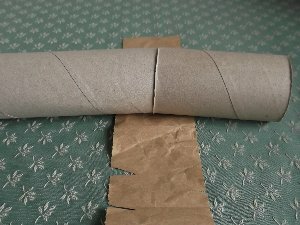 Just cut a long strip, paste it and roll the two ends of your tube until all the strip is stuck around it. Let it dry before you start painting. Earlier I said you can make a didgeridoo look real? Well no real didgeridoo is completely straight. They all have natural squints in them. You can make it look like that by inserting the ends at an angle before you stick the paper on. Look at the picture. 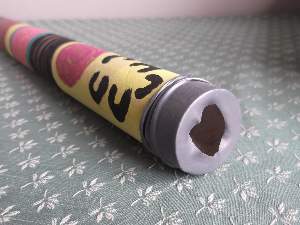 When your didgeridoo is dry you can paint it and decorate it with symbols. What symbols do Aborigines use? They like to draw kangaroos, emus, water, and water holes. You can even make some symbols up if you like. People are another symbol they use a lot but the shape does not look like a person. It looks like a fat U shape. A group of people are usually depicted as U symbols all facing each other in a circle. See the end of my didge in the photo at the top of this page. Dividing your musical instrument up with thick black, green, orange, or yellow wavy lines and patterns make it look like a real didgeridoo. 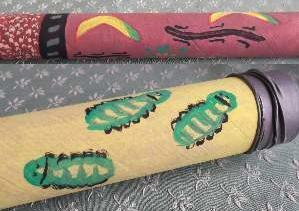 I have painted some on cardboard tubes to inspire you. Boys! Who said you can`t have pink didgeridoos? Sometimes the musician will use bees wax on the end of their instrument to make it comfortable and to make it fit around their lips so no air can escape. We won`t put wax on ours but you can cut the tip off a balloon making it have two openings, and ease the original opening onto the end. Now you are finished. Doesn`t it look real! Enjoy your Aborigine musical instrument! Now we have a wide range of homemade musical instruments to make up a band.